The Upper West Regional Tourism Awards has honoured eighteen service providers in the tourism industry in recognition of their dedication to service and product excellence. They were presented with certificates and citations in recognition of their role in providing excellent custom services and helping promote tourism business in the Region. 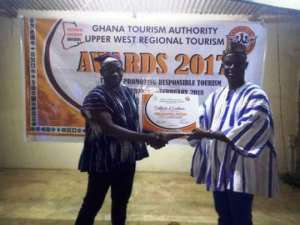 The event, which was organized by the Ghana Tourism Authority (GTA) over the weekend, adjudged Nuoyong Empire Hotel, a two star hotel, as Hotel of the Year for raising the bar in terms of enhancing visitor experiences. Mr Henry Yeleduor, the Upper West Regional Manager of GTA, said the Regional Tourism Award instituted as an annual event is meant to reward deserving industry practitioners and stakeholders who have demonstrated commitment towards the development and growth of the industry. He said the value of recognizing and rewarding champions of exceptional service is intended to set and raise the standards of what was attainable and desirable in the competitive global tourism market, thereby, helping to raise overall standards in the industry over time. While the sector continues its progressive growth and development, it is essential as service providers to remain true to the core values of providing consistent exceptional service to their valued customers, he said. Mr Yeleduor said the event was all about the promotion of ethical practices in the tourism business as highlighted by the theme: 'Promoting Responsible Tourism'. He applauded the award recipients for their excellent performance and reminded them that one of the biggest fundamental elements of excellence was respect and care for their customers. 'I wish to challenge you to become ambassadors of service excellence in your areas of operation through skills transfer and mentoring other similar establishments, especially the emerging businesses,' he said. Mr Akwasi Agyeman, the Executive Director of GTA, in a statement read on his behalf by Alhaji Hakeem Ismail, the Upper East Regional Manager of GTA, said tourism is a key pillar in the economy. He said the industry is expected to make greater contribution to Ghana's economic transformation and growth agenda. 'This would be done through the creation of jobs, improved infrastructure to support tourism activities and the demand the sector would exert on other sectors like agriculture,' he said. Mr Agyeman said the bold vision, given the strong competitive environment in which international tourism operated, requires the redoubling of collective effort at all levels to position Ghana as a preferred tourist destination. The mainstreaming of a professional service culture across the entire spectrum of the industry is critical as it has helps to raise individual contributions and shape the visitor's appreciation of Ghana. He said GTA was taking steps to enhance visitor experience through the establishment of Highway Rest Stops along major highway corridors and upgrading of selected tourism sites nationwide. It is also collaborating with the Ghana Civil Aviation Authority (GCAA) to revise the guidelines on the operation of air charters to encourage more leisure traffic while also intensifying its marketing efforts in the United States, Europe, Asia and Africa. The Director said the Authority has never relented in its advocacy role in furtherance of the sector's interest, saying Ghana Investment Promotion Center (GIPC) has re-introduced duty exemptions on inputs for tourism investments. Presentations have been made to the Electricity Corporation of Ghana for a special band for hotels for computation of tariffs and that the discussions are ongoing, he said. 'We are also leading a renewed domestic tourism drive under the See Ghana, Eat Ghana, Wear Ghana, Feel Ghana Initiative which would impact positively on the patronage of your establishments', said. Community harmony and effective stakeholder participation, he noted, are necessary ingredients for a successful tourism sector. He urged Metropolitan, Municipal and District Assemblies and traditional authorities to ensure tranquillity and work in closely with each other and relevant government agencies as well as private sector operators to develop and grow tourism.